I hope I’m not too late in joining this challenge as the year is almost half over already! This seems like a lot of fun, and I go through cookbooks quite frequently. I’m going to aim for the Glutton. I figure between this challenge and Weekend Cooking I’ll be able to get through a number of cooking and food-related books. 2. 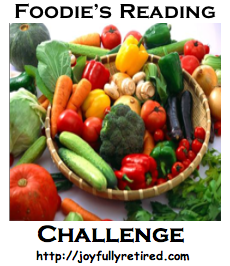 Grab the challenge button and write a post on your blog so we can spread the word. No blog? That’s okay. Sign up in the comments section. 3. As you read each book for the challenge, come back here and tell us about it. On January 1st I’ll provide pages so you can post links for your reviews. Non-bloggers will use the comment section. You don’t need a pre-selected list of books. Crossing over with other challenges is fine. To encourage you to return here and tell us what you read, there will be a prize at the end of each quarter. I’ll use Random.org to select from all the books you tell us about. Each book read will be one more chance to win. Sign Up Here: Sign in using Mr. Linky below. Put your name or blog name on the first line and your blog address on the second line. Non-bloggers will use the comment section. This entry was posted in Books and tagged Foodie Reading Challenge. Bookmark the permalink.